Spain-based Chicisimo has managed to establish itself as a go-to destination for street style inspiration, building a vibrant community for fashionistas to share their looks and tag their closet, opening them up to the world. Brands like Zara and H&M have joined Chicisimo, showcasing looks that feature their designs and rewarding the most stylish Chicisimo members. TNW: Lets start with a few words about where Chicisimo stands, what’s your focus now? Gabriel: There are millions of girls out there who have to decide, daily, how to combine a yellow sweater, or how to rock a little black dress, or simply, what to wear tomorrow. We believe helping girls make these decisions is a very interesting challenge, and that’s our focus! We are obsessed with building an awesome and useful product for the community. Right now our two main features are “share your looks” and “create an album of looks” – you can create an album and aggregate looks with ideas to go to a wedding, or looks with military style, or anything that makes sense to you. TNW: Which countries are most active on Chicisimo? Gabriel: Europe and the US. In Europe: Germany, Spain, UK and Italy. TNW: What’s the secret of building such an engaged community? Gabriel: This is a difficult question! Not sure if we could replicate. Maybe the secret is that we do not build products, but rather, we test products. And whatever works better, it’s what the community seems to want. We are now starting to be happy with our iteration process: fast and quick iterations, and understanding how the community reacts to them. TNW: You offer ranking of brands’ popularity by country, do you see a correlation between a brand’s popularity and its online activity? Gabriel: We are opening up the data so anyone can use it to draw conclusions. And more than specific conclusions, what it is important is that this data exists. This type of behavioral data did not exist before! Just think about iTunes. Before iTunes the music industry did not really have data on what music people really listen, and how they listen to it. They had sales data, not behavioral. The fashion industry will go through that same process. But we have seen a correlation between strong ecommerce platforms and increase in popularity. Brands with a strong bet on ecommerce are growing the fastest (J Crew, Mango, Asos, Zara are some examples). 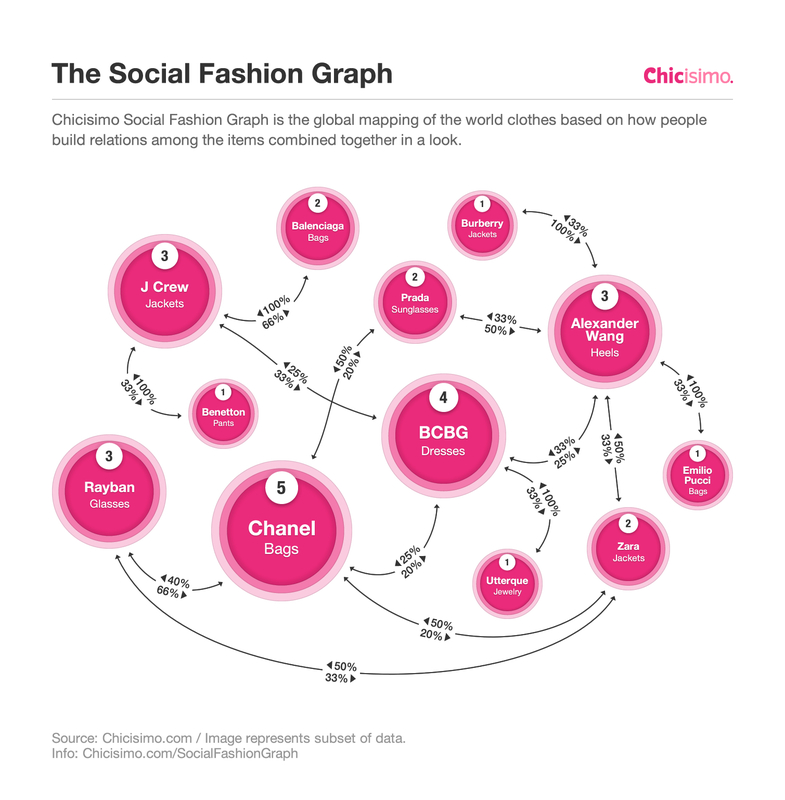 TNW: What’s Chicisimo Social Fashion Graph and how does it work? What kind of connections have you discovered with its help? Gabriel: We have built the Social Fashion Graph, which is the global mapping of the world’s clothes, and how people build relations among those clothes, while they get dressed. When you get dressed, you choose to bring together different items. For example, you choose to wear a BCBG dress together with a J Crew jacket. Implicitlely, you are building a correlation among those two items, you are saying that, according to you (to your look), it makes sense to wear those two items together. You are contributing to the graph. The Social Fashion Graph is built on top all these relationships between looks. The looks are the raw data, and we at Chicisimo are structuring the data in such a way that we can obtain insights, and share those insights with the community. The Social Fashion Graph is not static, it’s moving and changing based on changing tastes. We can obtain different subsets of the graph, for specific brands, items, colors, countries, subgroups of people, etc. Some of the key findings are here – for example, we’ve learned that Zara has doubled its US penetration one year after they launched their ecommerce offering in the US. We learnt about this by analyzing the Social Fashion Graph. TNW: Do you plan to provide access to brands and developers to the Social Fashion Graph? Gabriel: Access to the Social Fashion Graph is only internal at the moment. There is not yet an interface for companies to access it, and the specific access plans are still to be defined. At some point, we want to open up the data for anyone to do stuff with it, like build apps on top of it,enable recommendations; etc. So many things can be build! Read next: How much freedom do you really have online?